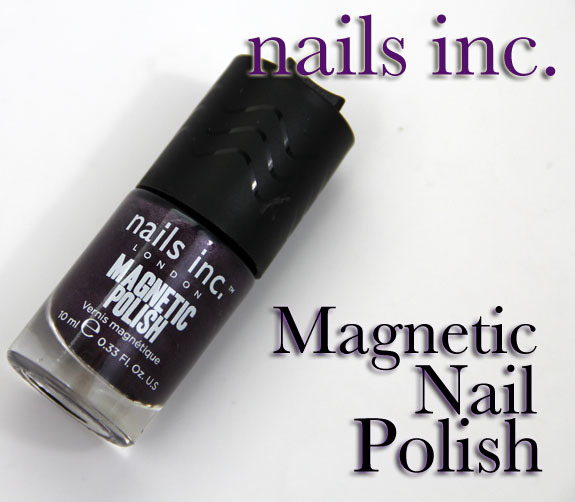 I am sure you have heard by now that Nails Inc. has two new Magnetic Polish colors out. The colors are Trafalgar Square (Chrome) and Houses Of Parliament (Purple). I’ve got a how-to of sorts for you today with Houses Of Parliament. I found this polish to be a little easier to use than the LCN Magnetics I previously reviewed. First off notice that the top cap pops off to reveal a smaller round cap, easy for applying the polish. The top part contains the magnet. 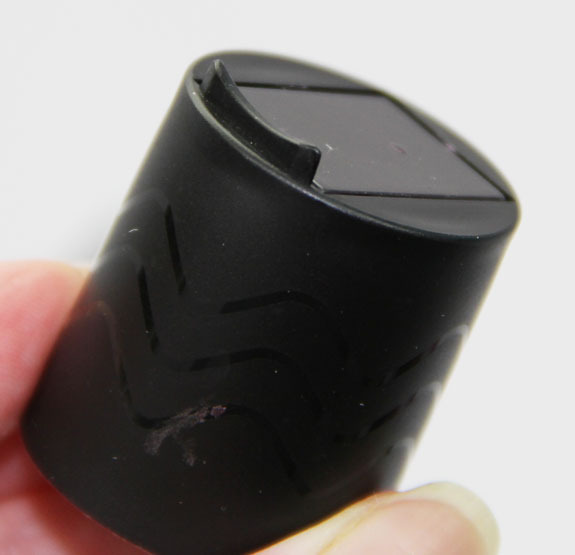 Here is the built-in magnet in the top part of the outer cap. 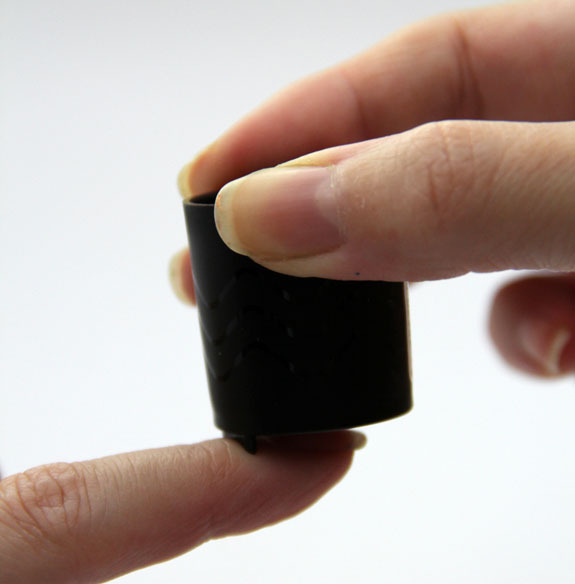 You can use it as a balance over your nail so that you don’t touch the magnet to the actual polish (which is REALLY easy to accidentally do). It definitely helps in keeping your hand nice and steady, and helps give you even results. Remove all oils from your nails using nail polish remover. Paint one coat of the polish on all your nails and allow to dry for at least 5 minutes. One finger at a time, paint another coat then immediately place the magnet on top of your nail (hovering, not touching) and leave on for 15-20 seconds. Be really careful not to paint too thick of a coat because the magnet will actually pull your polish off in tiny drops and get all over it! This happened to me the first time I tried it. Continue with the rest of your nails, one at a time. Paint a top coat over it. Houses Of Parliament is a deep eggplant purple shimmer. The polish is very thick and covers really well. When you use the magnet on top you get a nice lighter purple swirl mixed in. I found this to be really easy to use and I wound up getting nice even results. Love it! I do wish it was less expensive, but at least you get a good sized bottle, not a mini. What do you think about this one? 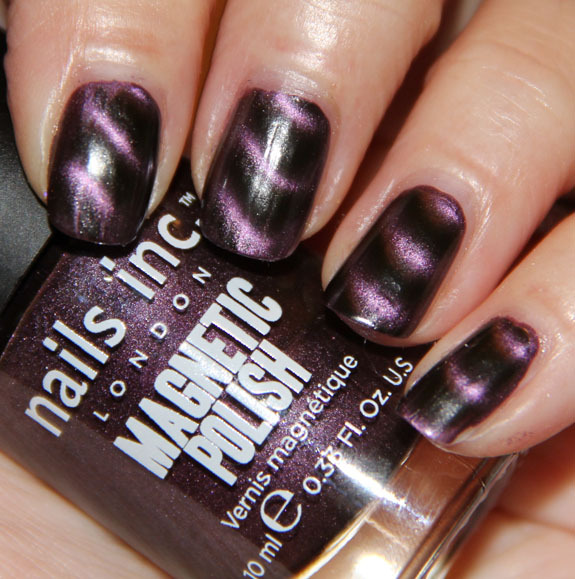 Have you tried magnetic polish yet? I haven’t tried magnetic polish yet and I don’t think I will. It’s an interesting concept, but I don’t love the finished look, and it sounds like a lot of work! It’s quite expensive for a polish too! Just wanna say that there is another color, a gold called Big Ben. I bought Trafalgar Square because of Sephora’s sale. I haven’t received it yet but I’m excited to play around with it! It’ll be the first magnetic polish I try, since the other brands are kind of hard to get here. I noticed that there’s a green one on Sephora’s site too, although it’s not in stock yet. I might need that one too, haha. 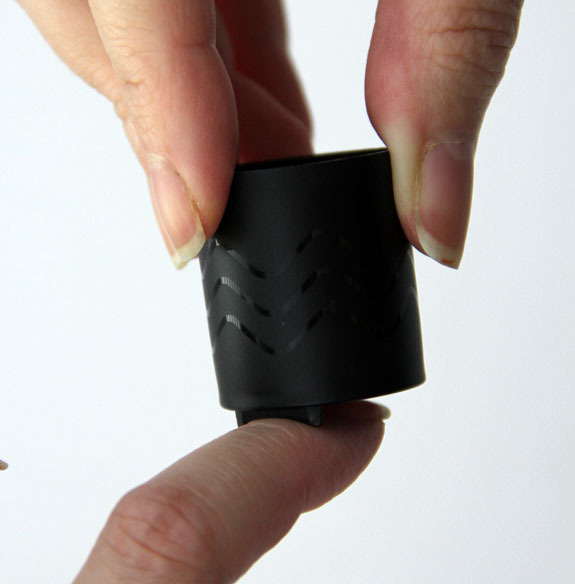 This has such a cool effect, and I think the packaging is really smart to have the magnet built in with that little plastic “rest” to help you avoid touching your nail. Thanks, also, for the tips on how to use magnetic polish! I have this polish and the grey, Trafalgar Square and I love the look, I prefer the purple colour to the grey. I have found it a little difficult to get the pattern to go right across my nail, it seems to only do the middle. Maybe I’m not holding the magnet for long enough. I hope Nails Inc bring out a couple of brighter colours like a tomato red or frosty blue for the winter months! I have some magnetic nail polishes, and while I like the idea, it takes a lot of time and a few attempts to achieve a satisfactory look. I have a few magnetic polishes from the brand “Layla” that I really like. They don’t have the removable cap and they’re about the same price ($15.50) but I didn’t have to pay shipping and they come in more colors. I just wish magnetic nail polish would go down in price! Essence had some magnetic nail polishes, but I’m not sure if they were ever available here in the US. Actually I’ve seen essence magnetic polish in my ultas for months now (abt half a year ago)! So maybe try looking at ur ulta? Teemetric´s last post…Happy Halloween! — Costume Pic! I have Boots No7’s version of this, and it looks exactly the same colour and has exactly the same lid. I wonder if they are actually made by the same company? I was just about to comment the exact same thing haha. Hi ~ Its nice but I dont know how much I would use it. Its a little pricey but it looks good on you!! I have Nails Inc. magnetic polish in Trafalgar Square (the chrome grey color) and I have to agree with Kelly, this polish is very user friendly and easy to apply. It gives your nails such a cool, 3D type of effect…definitely attention grabbing. Love it! I actually put Houses of Parliament on last night as well. I thought the formula was excellent as was the brush vs. Layla Magneffects. I got this and tried on it one nail just to test it out and it didn’t work. I’m not sure what I did wrong, but it was so expensive that I am afraid to try again and waste it. Did you follow the directions to a tee? 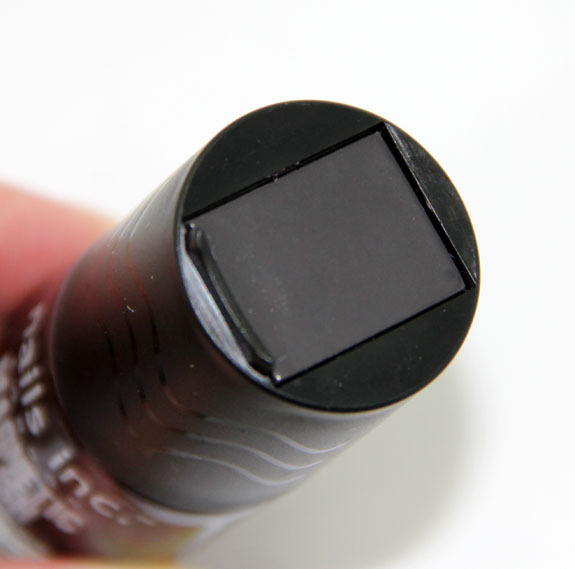 You pretty much have to for magnetic polish to work. I’ve got the chrome sitting on my desk and waiting for me. I’m a little nervous! I bought this when it first showed up online at Sephora. Sadly, I haven’t used it yet. So many other polishes that are distracting! that little lip is awesome! very clever! I haven’t tried mine yet, but appreciate your tips and the swatches! I didn’t have good luck with the LCN polish, so I hope this is better. I REALLY want to try this polish! Well…any magnetic polish. They are such a great idea! Thanks for the awesome, highly descriptive blog post! I can’t wait til I can get my hands on this! I was actually going to pick this up at Sephora a week or so ago then I saw the 16 dollar price tag and almost through it across the store. I love the look, but I’m not willing to pay that much especially since polish does not last long on my nails. Hopefully a bargain brand will make their own version soon. i want to get my hands on these ,! i have the Layla ones but it doesn’t have the rest like this ones does! btw i love this color on ur skin tone!